I met a motojournalist the other day who reckoned the KTM 690 Enduro R is the best bike he’s ever tested. He liked it so much, he bought one for himself. 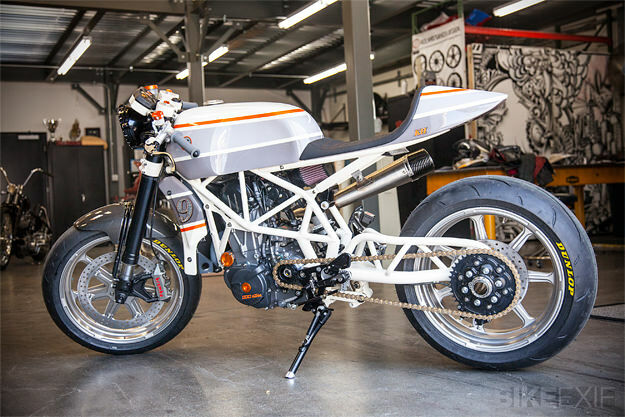 The design of the Austrian machine is strong and distinctive, but for some, the ‘KTM look’ is an acquired taste. 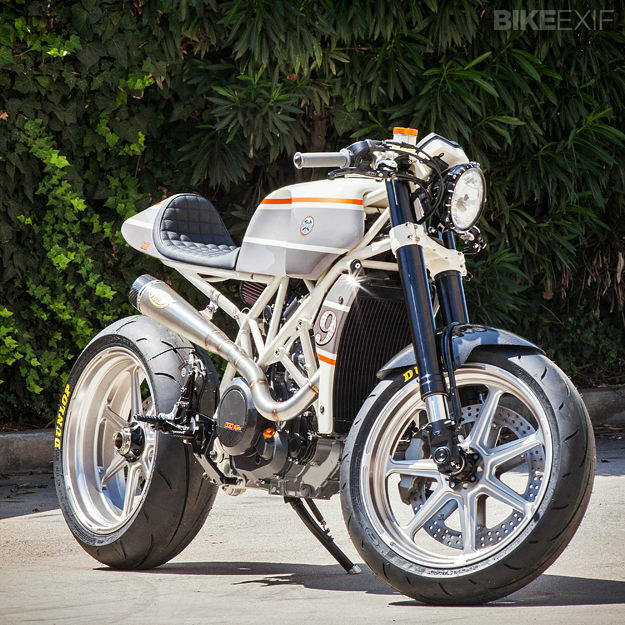 So here’s an alternative, courtesy of Roland Sands Design. And being a former racer, Roland couldn’t resist giving the 66 hp, 305 lb bike a performance boost too. With a seat height of almost 36 inches, the 690 Enduro R is a fiendishly difficult bike to reconfigure. But somehow, this one works. The bodywork is all-new, hand-fabricated from aluminum, with paint by Chris Wood of Airtrix. He’s retained the signature KTM orange in a classy stripe. KTM is renowned for its extensive Powerparts catalog, and RSD have plundered it to boost engine output. An EVO 2 tuning kit was installed (including a race-profile cam and K&N filter) along with a smattering of lightweight ancillary parts. The exhaust is RSD’s own ‘Slant’ design, customized to fit the single-cylinder engine. The stock rims are 21” at the front and 18” at the back, but RSD have fitted 17” ‘Morris’ wheels with a custom nickel anodizing effect. The forks are from a 690 Duke, shortened and revalved by Race Tech. 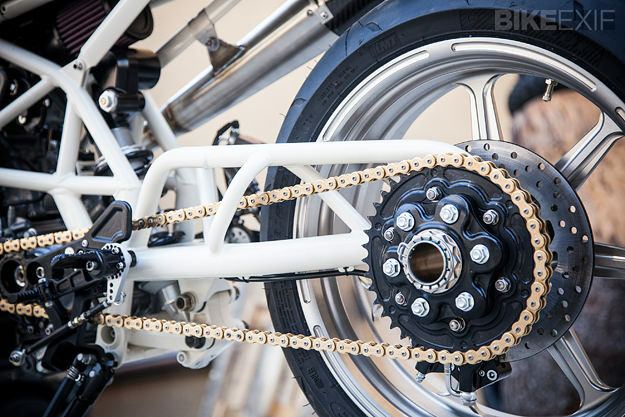 The swingarm, styled to match the looks of the trellis frame, is hand-fabricated and hooked up to a custom Race Tech shock. The tires are Dunlop Q3 Sportmax street/trackday hybrids. And to eradicate any remaining doubt about the performance focus of the KTM, the rider now hangs on to clip-ons from Graves Motorsports. 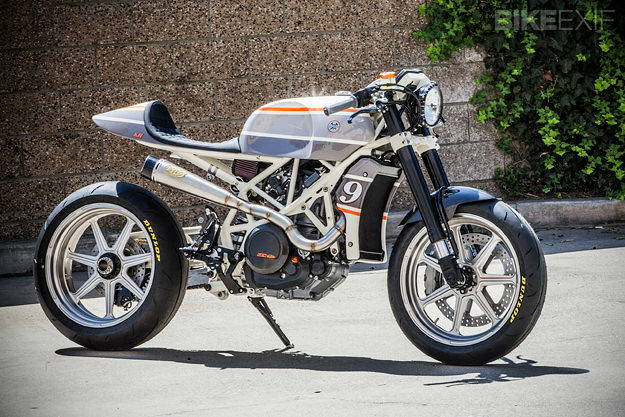 There can’t be many customs that could handle the twisties with as much aplomb as this one. And parked up, it’d stop the traffic. I’m sold. 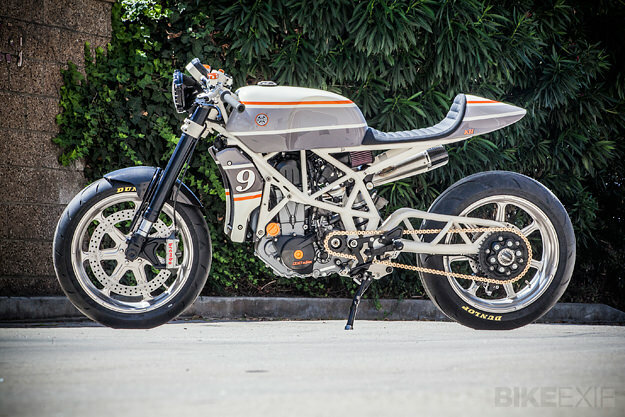 Keep track of the latest Roland Sands builds via his company website and Facebook page.